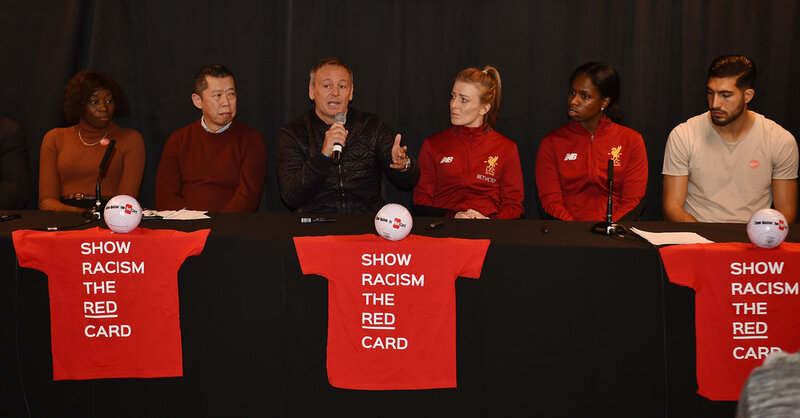 On Thursday 15th March 2018, Show Racism the Red Card (SRtRC) held an educational event at Anfield, the home of Liverpool Football Club. The campaign worked in partnership with Liverpool FC to educate local young people about the dangers of racism. 130 young people from local primary schools attended the event which saw the Year 5/6’s take part in an educational workshop, watch the SRtRC educational film and then take part in a ‘Press Conference’ with a panel of special guests. Young people from local primary schools arrived at Anfield in the afternoon and headed to the room where they would spend the remainder of the afternoon. As an extra special treat young people had the opportunity to take a picture with the Champions League trophy which was kindly brought across to the event by staff from the Liverpool FC museum. After a quick introduction to the afternoon, the young people went into an educational workshop which was conducted by Campaign Worker, Ben Holman, from SRtRC. The workshop made young people explore stereotypes, define racism, and think critically about the way in which we stereotype. The young people engaged in thoughtful and honest conversation with their peers about the dangers of stereotyping. First to join the panel was Councillor Natalie Nicholas who had taken the time out of her day to attend the event. Rob Jones, Managing Director at Stagecoach Merseyside, and sponsor of the Liverpool FC poster also joined the panel. Robert Brennan from Sefton CVS and long-time supporter of SRtRC, was the next panel member to take a seat. John Au from the Anthony Walker foundation joined the panel and kindly donated prizes to the winners of the best question asked during the press conference. Former professional footballer, John Beresford, attended the event and sat on the panel, John recently received an MBE for all his work with SRtRC over the last 22 years. Liverpool FC Legend, Howard Gayle, joined the panel, Howard was Liverpool FC’s first ever black player. Ladies players Kate Longhurst and Satara Murray both took the time to attend the event and answers questions about racism from the young people. Emre Can and Georginio Wijnaldum both sat on the panel to round off an all-star panel. Young people from each school put forward a variety of questions to the panel regarding racism. Have you ever been judged and if so, did it make you quit? Have any of you ever suffered racism on social meda? Have you ever suffered racism because you didn’t score a goal? These were just a few examples of the questions that the panel were taking it in turn to answer. The panel explained to the young people what they should do if they experience racism and who they can report it to. The panel also provided brilliant advice on what each person can do to tackle racism. Emre, Georginio and Satara all shared with the audience powerful stories of how they had suffered racism, or how someone close to them had suffered racism. Prizes were given out to the three best questions asked to the panel and Liverpool FC kindly donated a rucksack full of LFC merchandise to the panels favourite question. The panel agreed that their favourite question was from Harry who asked, ‘If you were to suffer racism which one of your teammates would you speak to?’. Show Racism the Red Card would like to thank everyone at Liverpool Football Club for their support in organising the event and a special thank you to Heather Farrell, Simon Thornton, Kevin Guy and Alison Boyle who made the event possible. The power of role-models to educate young people should never be underestimated, therefore, a massive thank you to Rob, Natalie, John, Robert, Kate, Satara, Howard, John, Emre and Georginio. A big thank you to the event sponsors; Liverpool City Council, Sefton CVS, Stagecoach, Merseyrail, Liverpool City Region - Combined Authority and the Professional Footballers Association who continue to support the work of Show Racism the Red Card and make events like this possible. And finally, Show Racism the Red Card would like to thank all the young people for their honest engagement from start to finish.